You’ve heard it many times – your pet should see a veterinarian at least once a year for a preventive health visit or an annual wellness exam. As a pet owner you may not think there’s anything wrong with your pet or consider it necessary to take them to the vet. You may be questioning how important it is to schedule routine checkups for your pet. The answer is that it is important. A preventative wellness exam is one of the best things that you can do for your pet to ensure that they are as healthy as can be. Just like humans, we require routine checkups and wellness exams with our doctors to make sure how we doing health wise and detecting any problems. You pets require the same treatment. It is important to realize that pets age much more quickly than people do and therefore experience more health problems. Our pets have a faster metabolic rate, faster heart rates and shorter life spans, so physiology and pathology pass away quicker as well. Many people have a physical check-up once a year by their own doctor or they get screening blood tests, ECGs, ultrasounds, and other tests. Many conditions can be detected early and dealt with. Our pets can’t talk to us and tell us in words if something is wrong. Instead, they may limp, groan, or refuse to eat However, by this time there is something really wrong with them if they are reacting this way. You may think you’ll know if your pet is sick, but many pets, especially cats, hide their feelings and any signs of anything being abnormal. At Encino Park Veterinary Clinic, we are trained to examine, listen, touch, smell, to feel and to look for any problems that your pet may be experiencing. What cannot be detected with a physical exam may be picked up with blood tests, x-rays, or ultrasound. All these procedures can become very valuable in detecting a problem early on so that treatment can be started early on as well. You may not realize how important it is to regularly schedule a physical check-up for your pet’s health. During these checkups, veterinarians commonly detect signs of disease or other health problems. Routine visits allow for any issues to be found early and begin treatment. Diagnostic tests can be ran for in order for detection and medical treatment and for surgeries that may be needed. An annual physical exam allows the veterinarian to assess how things are going at different stages of your dog or cat’s life. The doctor will discuss concerns and answer any questions you may have about diet, exercise, dental care, behavioral problems, and vaccinations. Veterinarians will check vital signs: the temperature, pulse or heart rate, and respiratory rate of your pet as well as all parts of the body. 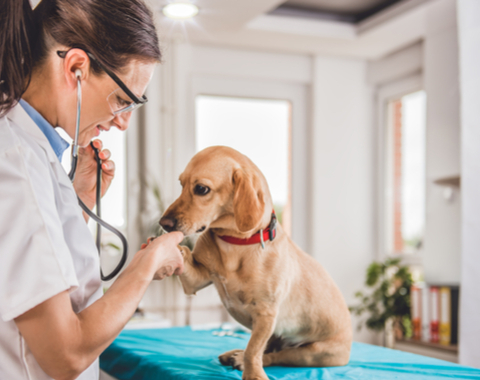 By scheduling routine exams for your pet, you are ensuring that they are living the healthiest and most comfortable life that you can provide for them. Don’t let your pet go untreated!